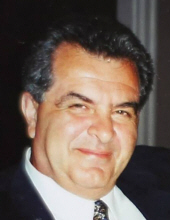 Dennis Joannides, an area resident since 1975, died suddenly on Saturday, March 30, 2019 at Orange Regional Medical Center. He was 75. The son of the late Harris and Helen Joannides, he was born on May 31, 1943 in Greenpoint Brooklyn, NY. During a graduation party for Hicksville High School, he met and had his first dance with the love of his life, Catherine Arico. They were inseperable and married 6 months later on December 2, 1961. From that moment on, he was the embodiment of a devoted, loving family man. Thoughtful and intelligent, Dennis was always "the" person to turn to for advice. He was the perfect Dad and took care of everyone. He was a hard worker his entire life and became a Fire Sprinkler Designer and owned Certified Fire Protection in Rock Hill, NY. He was amazingly honest, kind and generous to a fault. He shared his extensive knowledge of history with all. A joker with a great sense of humor (earning his Class Clown title), he loved making everyone, especially his family, laugh. Dennis was a good cook and his belgian waffle breakfast's were his family's favourite. He is survived by his wife Catherine, and four children, Chris and his wife Patricia of Middletown, Michael and his wife Tanya of Titusville, Fl, Terrilynn of Las Vegas, NV and Nicole Davis and her husband Mike of East Greenbush, NY, his 10 grandchildren, Caprice, Cassi (Cory), Christopher, Mikey, Nicholas, Alexis, Christian, Alex, Lily, and Maxwell, and two great-grandchildren, Noah and Elaina. He was predeceased by one grandchild, Bryan. Dennis' family invite you to celebrate his beautiful life on Wednesday, April 3, 2019 from 6-8pm at Applebee-McPhillips Funeral Home, Inc.
To send flowers or a remembrance gift to the family of Dennis Joannides, please visit our Tribute Store. "Email Address" would like to share the life celebration of Dennis Joannides. Click on the "link" to go to share a favorite memory or leave a condolence message for the family.